Home » SEO » SEO is Dead, Right? I just finished reading another article telling me how SEO is dead and Google’s recent algorithms are looking for quality content only is the answer. Well, let me first say that I strongly disagree. I have seen many websites that have fantastic designs, are appealing to the reader’s eye, have simple and intuitive navigation and provide quality content to answer the reader’s problems or buying needs. They have all that is needed to be on Page 1, right? Unfortunately, what I have discovered is that web designers are gifted in producing websites that dazzle the reader’s eye with easy-to-find, great quality content, but are often filled with 404 errors, broken links, missing titles and meta descriptions and have duplicate content and title issues. Each of these errors signals Google that this is not a well-kept site. I actually had a web designer that saw no problem with the number of 404 errors that his site had. The site was a real estate website and displayed pages with beautiful images and great descriptions of the homes for sale with an easy-to-use contact form. The problem was that as soon as a home was sold they simply deleted the page without taking into account how the page was woven into the rest of the website. At the time I spoke to him he had over 200 Page Not Found errors. In addition to that he had over 80 broken links for pages that other sites had removed that he had links going to. Lastly, he had the exact same meta description for every page on his site. Obviously it was much easier when creating the site to simply duplicate the meta description and paste it on every page. This is not very helpful to the reader when looking at numerous search results and seeing the same description for every page! The last item I looked into for this client was his backlink profile which unfortunately was a mess just waiting for Google to pounce on it. Now I am not saying that taking care of the issues mentioned above will jump a website onto Page 1 but I will say that they can certainly keep the website off of Page 1. These type of issues are an indication to Google that a website is not being checked and update regularly which is a definite negative signal to Google. In every case that I have looked into where the client was concerned about dropping in search engine rankings and loss of traffic I have found these errors to be prevalent. Auditing a website to discover errors such as these is the job of the SEO and as I said before I have not found that web designers are knowledgeable in identifying and correcting them. Many times in the design phase they simple take the easy approach of duplicating some items on every page. I had one client that had the same title and meta description on every page of his website. The titles were all crammed full of multiple keywords and were almost 200 characters in length when only 76 will show up in the results. 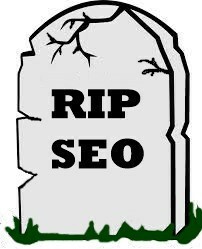 No, SEO is not dead and if you have a website and believe that you don’t need SEO it is only a matter of time before you will see your rankings and traffic decline. It is safe to say that the impact of individual aspects of SEO have less an impact on rankings than they once did but it is also important to know that ongoing SEO work in conjunction with a web designer is key to achieving and maintaining a high search engine ranking. Good SEO along with regularly adding quality content will help to move a website onto Page 1 and keep it there. Quality content alone will not do it.